Josh Barden hit a hat-trick to help Kirk Deighton Rangers to victory in the final of the Harrogate & District Senior Cup. Daniel Marshall’s troops triumphed 5-0 over Premier Division rivals Beckwithshaw Saints at Ripon City’s Mallorie Park on Saturday. And the Rangers boss felt his team were good value for their win, adding that he was “over the moon” to have secured the club’s first piece of silverware in three years. “The scoreline was probably harsh on Beckwithshaw, it was a closer game than 5-0 suggests, but we were certainly worthy winners,”he added. “It was a very even match for 40 minutes and nip and tuck until we got our first goal just before half-time. “Our second came 10 minutes after the break and clinched the game for us. It was pretty comfortable from there on in. 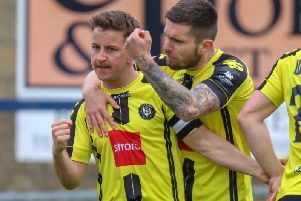 Barden broke the deadlock when he fired Kirk Deighton ahead in the 40th minute and then doubled his side’s advantage 10 minutes into the second period. The former Wetherby Athletic striker went on to complete his treble while Luke Dubery and Joe Wilkes also found the back of the Saints’ net.